There is a subtropical fruit whose consumption by those with ESRD can produce hiccups, vomiting, nausea, mental confusion and, in some cases, even fatal outcomes. The fruit has distinctive ridges running down its sides; in cross-section, it resembles a star, hence its name: starfruit. 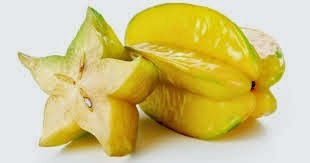 The starfruit is known under different names in different countries. The Portuguese word carambola is also widely used to name this fruit. It is the fruit of Averrhoa carambola, a species of tree, especially popular throughout Southeast Asia and the South Pacific. Carambola is also common in Brazil, where it is served as a fresh beverage, in natura, or as an industrialized juice, as it is also served throughout the world. Starfruit intoxication may be harmful and even life threatening in ESRD patients. In this setting, daily haemodialysis (or CRRT in severe cases) is the ideal treatment, whereas peritoneal dialysis seems of no use, especially when disturbance of consciousness ensues.